Amid the many trends ebbing and flowing through home improvement, one, in particular, seems likely to stick around. Known for their versatility, barn doors have been popping up in homes across the country — in contemporary and rustic designs. With this design element found on such opposite sides of the style spectrum, one might wonder what it is about barn doors that people love so much. If you’ve found yourself asking the same thing, read on to discover why adding a barn door is an ideal winter home-improvement project. As homeowners seek more open floor plans, interior doors are evolving. Barn doors meet homeowners’ desire for fluid room flows by seamlessly connecting adjacent rooms, allowing the flexibility to close spaces off or join them. “The rolling feature of barn doors creates a fresh look in any home,” says Brad Loveless, product development manager for Simpson Door Company. “The functionality of a door mounted on a barn track allows homeowners to control the degree to which spaces are opened or closed.” Unlike conventional hinge-mounted doors, barn doors open up previously divided rooms with an air of intentionality. Like a distinctive piece of art in the home, the right interior door can showcase a homeowner’s style and personality. An unexpected door style tells a story that creates a great discussion point when entertaining friends and family. Is your home lacking something that inspires creativity and sparks conversation? You may find that a barn door is a simple solution to this problem with its eye-catching rolling feature. They’re subtle but bold. Innovative, but not over the top. 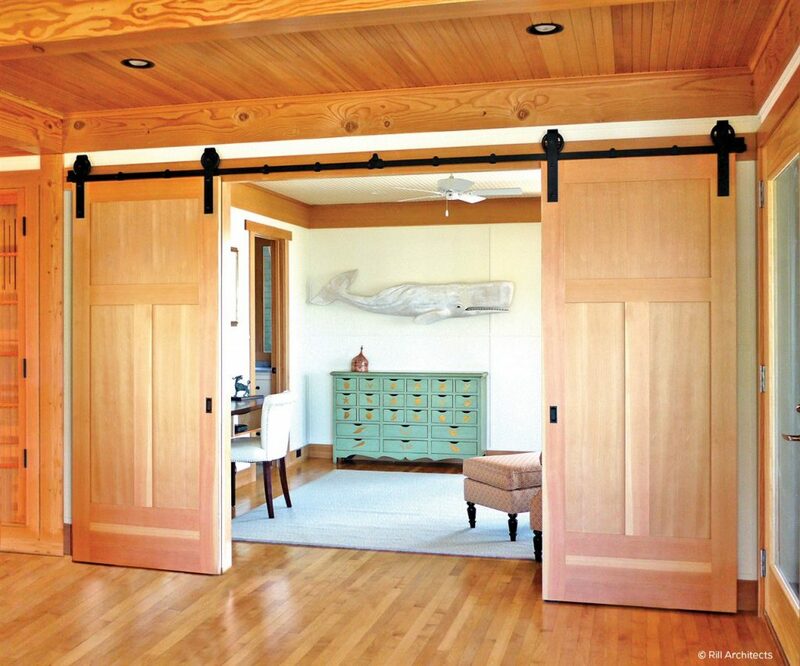 Barn doors catch your eye, without taking over the room. Do you ever worry that the sweater you bought last week will be out of style in a year or two? Are you forever a trend skeptic since the bell-bottom era? (If those can go out of style, anything can, right?) Contrary to what may feel like their recent popularity, these farmyard-meets-indoors statement pieces have been around for over a decade. Today you’ll find barn doors with a modern, sleek look, rustic wood paneling or even those made with a chalkboard. Barn doors are available from a number of companies. For homeowners who like the look and feel of wood doors, Simpson Door Company offers rustic-style barn doors, as well as sleek, contemporary doors that can be mounted on barn track hardware. You won’t regret moving this installation to the top of your priority list of winter home-improvement projects. Adding a barn door while you’re stuck inside for the cold months makes an immediate visual difference in your home and can provide a scenic backdrop for holiday photos.